In 2005 I was working as a field engineer and partly responsible for R&D related stuff. Especially when testing out new software, it was an challenge to constantly reinstall desktops to a clean state in that process. So we started using VMware Workstation. And that saved us with a lot of time that could be wasted in reinstallations. Now we were able to create snapshots, whoohoo! Early 2006 our management decided that for a new infrastructure we needed to consolidate our servers and because of our experiences with VMware technology, vSphere was chosen. That was the same year that I executed my first vMotion. A game changer! A couple of things to be honest. First of all, there are too few architects focussing on EUC solutions. As VMware is more and more aiming on taking over the Digital Workspace market, proper knowledge and experience of architecture is needed to achieve that goal. At VMware as well as partners. So I decided to have a part in that and go for it. Second, I wanted to gain skills as an architect. In the past couple of years I designed quite a lot infrastructures, from vSphere to vROps to Horizon View and Workspace ONE. Every design got better and better, but I wanted to take my skills to a next level. And VCDX-DTM was the way to go. And third, I don’t have a bachelor or master degree in IT because I disliked long-term education. In this case I was working on something that I really enjoyed and gave me a lot of energy. So when finished, it validated my skills as an architect and that was a great feeling. 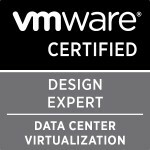 In total it took me 14 months from the first day at the customer until the final email from the VCDX program that I passed. A wise man (or whatever it is) once said: “Do, or do not. There is no try”. And that is probably the one thing that kept me focused. Especially when things went bad. And most of us know that you will go through hard times. So before you start, be absolutely positive that this is what you want. Also, it has a low WAF which needs to be compensated with boxes of chocolate, roses and romantic dinners. And of course, enjoy the journey. Because even in the hard times it is still a lot of fun! I would contact a mentor much earlier in the process. After delivering my PSO documents to the customer, I continued working on these documents for the application until my first mock defense (3 months prior to the application date). During that defense my complete design got roasted so I had to rewrite 231 pages so it was panellist-proof (although no one really knows what that means). I would probably not have used the PSO kit if I could start all over again (which might happen if I want to go for DCV or CMA). ITQ Consultancy is one of the most awesome employers in the world. We invest in knowledge to share knowledge. And now they have the first VCDX-DTM in the Benelux in their presence (next to Sjors Robroek, VCDX-NV and Marco van Baggum, VCDX-DCV). And they are really proud of this achievement. After passing the defense, I took a couple of months off of studying. But I want to focus on one of my weaker competencies, networking. Mainly by aiming for both Cisco CCNA and VCP-NV certifications. The journey and certification made me a better architect. So it was definitely worth it!